Uttar Pradesh Secondary Education Service Selection Board has declared merit list for PGT, TGT recruitment 2011 posts. The process of selection took a long time of about 07 years due to various reasons. Candidates who have applied under TGT, PGT posts for advertisements under 02/2011 and 03/2011, can check the UPSESSB TGT, PGT Result 2018 as the PDF Attachment issued by the Board. Uttar Pradesh Madhikik Siksha Chanyan Board has issued the UPSESSB TGT/PGT Result 2011 for Hindi, Civics, Commerce, Science, Botany, Psychology, Science, English, Arts, Music, Urdu, Home Science, Agriculture, Mathematics subjects. You can check the UP TGT / PGT Teacher Results 2011 from the link below. Based on the performance of the candidates in the written examination held in June 2016, the candidates have been shortlisted for the interview. The procedure for checking the results and other details is given below. To see UPSESSB TGT/PGT Result 201 see, candidates should keep their roll numbers ready because the merit list will not display candidates’ names, but it will display the roll number of selected candidates. At present, UPSESSB TGT, PGT Result 2018 is announced for TGT Agriculture, Mathematics, Commerce, English, Arts, Music, Urdu, Home Science (02/2011) and PGT Arts, Sociology, Education, Sanskrit (03/2011). Candidates who have participated in the section process are advised to immediately examine UPSESSB TGT, PGT result 2018. The selected candidates will be contacted soon by the Board. 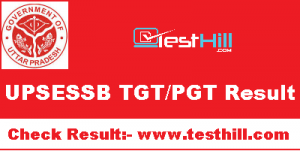 To check UPSESSB TGT, PGT Result 201 UPS, see the instructions below and download it only in one click on testhill.com.